Final Draft Proposal was submitted to DWR on March 23, 2017. If you have any questions please email Virginia Maloles-Fowler at vmfowler@dpw.lacounty.gov. Comments must be received by 12:00 noon on March 1, 2017. Comments received after that deadline will not be accepted unless the Task Force determines otherwise. Send comments to Virginia Maloles-Fowler at vmfowler@dpw.lacounty.gov. On August 1, 2016, the Department of Water Resources (DWR) released the Final Request for Proposals for the Disadvantaged Community Involvement Program (DACIP). DWR designated $9.8 million of Proposition 1 grant funding for the Los Angeles - Ventura Funding Area. The purpose of the DACIP is to involve disadvantaged communities and economically distressed areas in the Integrated Regional Water Management (IRWM) planning process. The Program seeks to increase understanding of water needs in these areas and develop long term solutions to address these needs including developing projects. 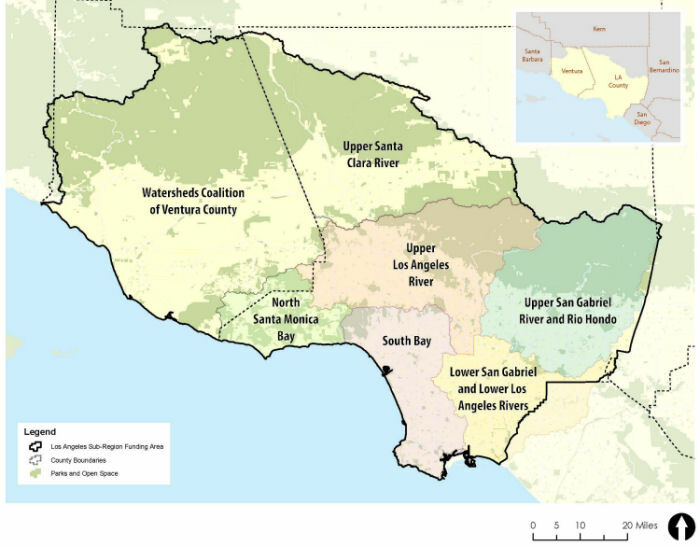 There are three IRWMs within the Los Angeles-Ventura Funding Area: the Upper Santa Clara River IRWM, the Watersheds Coalition of Ventura County IRWM and the Greater Los Angeles County IRWM. This website is for the Greater Los Angeles County IRWM. For information on the Watersheds Coalition for Ventura County and Upper Santa Clara River IRWMs, please see links below. The Los Angeles County Flood Control District (LACFCD) is the Chair of the Greater Los Angeles County (GLAC) IRWM. The LACFCD has been selected as the applicant for the DACIP, representing all three IRWMs. The LACFCD will also serve as the Grant Administrator. Development of the DACIP Proposal will be the responsibility of a newly formed DACIP Committee. The DACIP Committee consists of two representatives from each of the three IRWMs, for a total of six members. The GLAC IRWM's representatives on the DACIP Committee are the Chair of the GLAC IRWM DAC Committee, and a representative from LACFCD. Development of the scope of work for the DACIP will be largely based on input and recommendations from community based organizations, NGOs, public agencies, consultants, and other stakeholders. The GLAC IRWM maintains a list of consultants to provide as-needed support services for their IRWM program. This contract was last updated in September 2016. The contract covers activities including grant application preparation, grant administration support, research and studies for IRWM projects, updating the GLAC IRWM Plan, outreach, regional coordination and support for the DACIP, and other services. Consultants under contract on the as-needed list are contacted and issued task orders based on the needs of the GLAC IRWM. The GLAC IRWM anticipates issuing a task order to one of these firms to oversee the implementation of the DACIP Program. It is expected that the firm chosen will be directed to work with and where possible utilize the services of community based organizations, NGOs, public agencies, specialty consultants, and other stakeholders to implement the program. The DACIP Task Force consists of members from the three IRWMs. The DACIP Task Force meets monthly. Participation by interested parties is highly encouraged. Currently, the GLAC IRWM DAC Committee includes 2 members from each of the five subregions in the GLAC IRWM. Participation by interested parties is highly encouraged! Please sign up below for notifications of meetings and other GLAC DACIP events. Meetings are scheduled bimonthly to prepare for the application. As the DACIP develops, Committee meetings and membership may be changed to respond to the needs of the Program. Workshops for interested stakeholders to gather feedback about potential program activities are scheduled in October. Please join the discussion and learn more about DACIP. Click on links below for more information. If you would like to receive information for upcoming Greater Los Angeles IRWM DAC Committee Meetings and GLAC DACIP community outreach events please enter your email below. Once you submit your email address, you will be sent a passcode. Please log in with the passcode and create a password which will enable you to login. Once you login, please scroll down to select Prop 1 DACIP events listed under the Water Resources heading.